If the NFL was a political party, it would have the same problem that the Republicans & Democrats do – a divided party. On one side, you have the NFC Trump/Sanders “Populist” conference, with the AFC representing the Bush/Clinton “Establishment/Status Quo” wing of the NFL. Why the NFC as the Populists and not the other way around, even though seven of the eight original NFL teams now play in the NFC? Because the two teams currently at the top of the NFC (Eagles & Vikings) were teams that were not seen as anyone’s Super Bowl favorite going in. Both were expected to be 9-7 at best by most of the so-called NFL experts, and “outsiders” in the race for the Super Bowl. Instead, both teams have surpassed expectations and are hoping to make 2017 a year to remember. On top of that, neither of these teams have ever won a championship in the 51-year history of the Super Bowl/modern era of football. And while one of these teams has fans that are loyal to a fault, they have a fan “base” that any team would be jealous of. On the flip side, the top two teams in the AFC, the Patriots & Steelers, have been a dynasty in their conference for so long, it’s hard to remember a time when they weren’t in power. These two teams have not only won 11 of the 51 Super Bowls, but since the 2001 season, have won the championship an astounding seven of the last sixteen seasons. One of these teams, in order to keep their hold on power, has even been accused of “rigging” games by stealing signs and deflating footballs, in order to make sure that their championship “foundation” remains intact. Will this be the year that these two dominant football families (the Rooney’s with the Steelers and the Kraft’s with the Patriots) began to fall from grace? Time will tell, but the climate is ripe for some new voices in the football world (just as it was in the political world), especially with young quarterbacks such as Carson Wentz and the Rams Jared Goff having such a favorable impact on their respective teams. As for the Eagles, they now began what is their toughest stretch of the season – a 3-game road trip which includes back-to-back games against the Seattle Seahawks and the L.A Rams, the two teams that sit atop the NFC West. Playing on the West Coast can be difficult for an East Coast team no matter who they’re facing, especially with the travel and time change involved. But playing in Seattle, which is considered one of the loudest stadiums to play in, is just an added degree of difficulty. Personally, the only reason Seattle’s stadium, CenturyLink Field, seems that loud (in my opinion) is due to its layout, which somehow manages to keep the sound in. I refuse to believe that fans in the Pacific Northwest can be louder than ours. As for the game, in any season but this one, most Eagles fans would have pegged this as a loss. 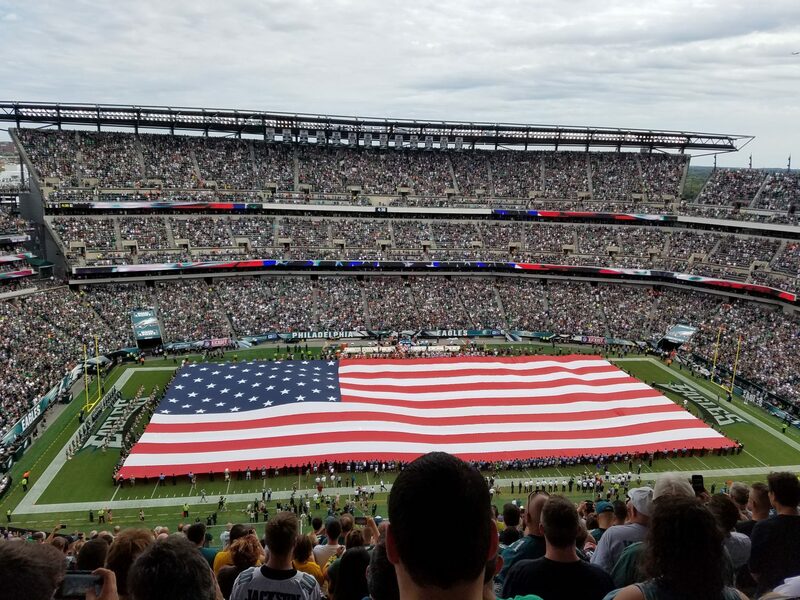 And most of us did back in the summer, before the Eagles home games started to resemble a college football game where a Division I powerhouse was beating up on the “Little Sisters of the Poor” (a.k.a the Akron’s and Georgia State’s of the college football world). As for my predictions, the last two weeks I stated that the Bears and Cowboys would score 20 and 23 points, respectively (in an Eagles win), to which loyal reader and fellow season ticket holder Steve Market remarked that he was “having trouble coming up with how either team would score” that many points. And to his credit, he was right, as both teams were held to single digits (the Cowboys nine points and the Bears only three). So this week, instead of doubting the Eagles defense once again, I am handing over prediction responsibilities to Steve, who is predicting a 31-20 Eagles victory. He also feels that since Wentz has already played in Seattle last season, his prowess of being a “film geek” will help to ensure that he’ll be better prepared this time around. And while we’ll be “waiting all day for Sunday night”, there are a few entertaining games on FOX to hold us over till the Birds-Seahawks kickoff on NBC at approximately 8:30 PM. First, we have the Vikings and Falcons in the “brunch w/ mimosas” game at 1 PM followed by the Panthers at Saints in the “happy hour w/ buffalo wings” game at 4:25 PM. And in case you’re not sure, you should be rooting for the Falcons over the Vikings and the Panthers over New Orleans. This Sunday should be a little tougher for our Birds than the last few weeks, as Seattle should be a good barometer of where the Eagles stand, though the Seahawks will be without defensive standouts Richard Sherman & Kam Chancellor due to injury. But a 31-20 victory sounds just as appetizing as anything I’d pick up at Seattle’s Pike Place Market. This entry was posted in Eagles, football, NFL, Sports, Uncategorized and tagged carson wentz, kam chancellor, New England Patriots, pittsburgh steelers, richard sherman, Seattle Seahawks. Bookmark the permalink.